Osteochondrosis of the cervical spine is a common disease, which in recent years began to hit young adults (25-45 years). It should be noted that the cervical spine is the most vulnerable part of the spine that is caused by a weak muscular corset and the special anatomical structure of the cervical vertebrae, which in this division is quite close located to each other. Because of the close proximity of the vertebrae, even a slight load in the neck, which as a result lead to the displacement of the vertebrae can contribute to compression of passing close to vessels and nerves. Cause of degenerative disc disease of the cervical spine may become injury and wrong posture, sedentary lifestyle and lifting weights, scoliosis (congenital or acquired). Meanwhile, the headache is most common symptom of cervical degenerative disc disease. In addition, this symptom requires careful consideration in the differential diagnosis of the disease, as headache can be observed in various diseases. Thus, when cervical osteochondrosis headaches may have a different character due to different mechanisms of its occurrence. Headache with osteochondrosis of the cervical spine can manifest changes in the nerve fibers and plexuses, and vascular disorders. The main syndromes of cervical degenerative disc disease can be referred to as vertebral artery syndrome, cervical migraine syndrome, hypertensive syndrome, diencephalic syndrome and radicular syndrome. In this syndrome headache appears already in the early stages of the disease. The pain is diffuse, a preferential manifestation in the cervical-occipital region. Pain in this case constant, while there have been periodic exacerbations, especially in the morning. During an attack of headache may be accompanied by dizziness, pronounced when turning the head, in rare cases, hearing loss (in one ear), staggering when walking and visual disturbances. The development of such symptoms due to compression of the osteo-fibrous growths of the vertebral arteries. When turning the head there is an increased compression, resulting in symptoms getting worse. Early signs of this syndrome is headache, which is characterized by increased pain when turning of the eyeballs and head. In addition, the pain may be accompanied by vomiting and nausea. The average attack lasts 2-5 hours. A similar syndrome is caused by compression of the arteries and veins in the holes, resulting in impaired venous outflow from the head, which leads to increased intracranial pressure and, therefore, these symptoms. For a start, it should be noted that the syndrome has nothing to do with the famous and classic migraine. It was named so because when the headache affects only one half of the head and neck part. The syndrome is manifested by pain in the head that occurs in the cervical-occipital region, extending in this case in the temporal and parietal region and eyes with one hand. The pain is often paroxysmal in nature, accompanied by vomiting. The duration of the attack is 6-10 hours. As a rule, during an attack of sick head is rotated in the direction opposite to the location of pain. It should be noted that this syndrome is often the initial with the development of cervical degenerative disc disease. 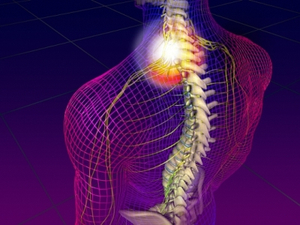 The syndrome is caused by an irritation of the spinal nerve. READ Why crunches and snaps the shoulder during rotation and circular motions: what to do? Sometimes this syndrome is also called hypothalamic, which is caused by the disruption of certain parts of the brain – diencephalic or hypothalamic. In this syndrome, there are headaches, chills, palpitations and sensations of falling. Symptoms appear in bouts, lasting about 30 minutes, ends, usually, frequent and copious urination. Sometimes patients have pain in the heart. This is called diencephalic syndrome. The cause of this symptom is prolonged irritation of the cervical sympathetic nodes. To the obvious causes include chronic disorders of cerebral circulation, caused by compression of the vertebral arteries, which provide blood supply to the hypothalamic region. the increase in body temperature (above 37.5 degrees). Treatment of headaches in cervical degenerative disc disease depends on treatment of the syndrome that caused the problem. During an acute attack is required to provide maximum rest to the patient, especially the cervical spine, which the patient must be put to bed. Undesirable in this condition are excessive movement in the neck extension and flexion. In addition, as recommendations for improving the condition of the patient advocate, the appointment of drugs that improve cerebral blood flow, vasodilators. The exacerbation of the condition to be treated only under strict medical supervision. In period between attacks the patient is assigned vitamins B and C, the drugs that normalize metabolism, glucose, etc. For the prevention of disease and complications, it is recommended to perform special gymnastic exercises, the implementation of which is today considered the best prevention of the disease. Note that exercises are not recommended in moments of aggravation of cervical degenerative disc disease, when a headache is particularly strong. Lie on your back and vibrates, then put your hand on your abdomen and the other on the chest. Take a breath. After 10 seconds, exhale and relax. Repeat the exercise for 5 minutes 5 times a day. Lie on your stomach and straighten your legs, then raise your head and chest, but so that the stomach and legs were pinned to the floor. Exercise repeat at intervals of 25 seconds for 5 minutes 5 times a day. Lie on your back and bend your knees, then turn on your left side, then right, alternately. Exercise repeat at intervals of 25 seconds for 5 minutes 5 times a day. Performs the exercise standing or sitting. You need to bend the neck, trying to get as close to your chest, then straighten, looking much further. When bent inhale, then pause, and on the extension of exhalation. In this position, to lie a hand on his forehead, then chokes him for 15 seconds. During exercise remains motionless. For simplicity, it is possible to rest my forehead against the wall.